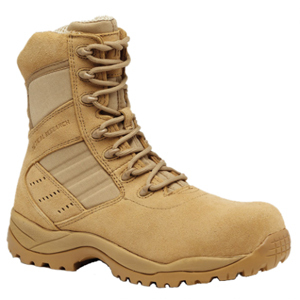 The Tactical Research TR336 CT Guardian Desert Tan Composite Toe Tactical Boot is the newest addition the Tactical Research family. This boot features a stain-resistant smooth cowhide leather for a sharp appearance all the time. The composite toe makes this one of the lightest safety boots that we carry. It is electrical and impact ANSI compliant and features Belleville's patented TR-1 orthotic Insole for maximum comfort. This boot is also Army Combat Uniform Approved.